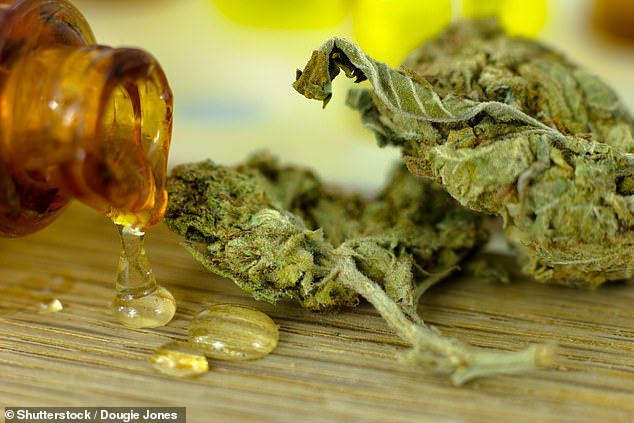 An eight-year-old boy with Tourette’s saw his involuntary tics halted after being given daily doses of cannabis oil. The unnamed youngster, believed to be from Poland, was left suicidal and unwilling to leave his own home because of the brutality of his condition. But his random arm movements and vocal tics almost halved in severity after being given a THC-based oil, a case report has revealed. The boy’s tics started when he was just six. The NHS states they usually appear between the ages of five and nine. Over the next year, his condition deteriorated and he was rendered unable to write because of the motor tics of his right arm. He also suffered ‘very loud’ vocal tics – but the tale, published in the European Journal of Medical Case Reports, did not reveal what they were. The boy became lonely after he stopped attending school and he eventually refused to leave home altogether because of his tics. Doctors who treated him in Warsaw said he also became ‘depressed, developed suicidal temptation and exhibited separation anxiety’. In hope of combating his tics, he was given a cocktail of drugs and two forms of therapy – but the methods all proved unsuccessful. Medics then started to supplement daily doses of risperidone and guanfacine, a drug used to combat the boy’s ADHD, with THC. Tetrahydrocannabinol (THC) is the compound in cannabis that makes users feel ‘high’. It is also believed to have medical benefits. The boy’s dose of THC was gradually increased over the space of two months, from 0.7mg to 3.6mg daily, according to the team at the Medical University of Warsaw. The boy, his parents, and teachers said the stronger dosage had ‘positive effects’ on both his tics and behavior. He was better able to focus at school, attended all of his classes and even began to spend time outdoors again. Doctors bumped up his dose three times over several more weeks, from 5.4mg to 18.2mg and then the ‘remarkably high’ 29.4mg. In comparison, the average cannabis joint rolled on the street contains in the region of 100mg THC. While Sativex – a cannabis-based medicine licensed to treat MS-related muscle spasms in the UK – contains less than 3mg per spray. Before being given the THC-oil, he scored 68 on the Yale Global Tic Severity Scale – a scale used across the world. This dropped down to 31 after two months, before being slashed even further to just 28 after four months of treatment. Other than mild tiredness, no side effects of the treatment were noted, according to the case report author Dr Natalia Szejko. She said it was the first evidence to suggest cannabis-based medicines could help children with severe Tourette’s. However, Dr. Szejko added the team of doctors ‘cannot entirely exclude’ the boy’s improved symptoms were because of a placebo. Though, writing in the case report, she did argue the boy’s tics only improved after the addition of THC. Ian Hamilton, a drug and mental health researcher at York University, told MailOnline: ‘There has been a lot of focus on the potential health benefits of cannabidiols but this study reports some specific benefits of THC in a young boy. ‘The findings are really surprising as the cannabis-based THC product used seems to have helped him focus and socialize which is a significant success for children with Tourette’s.